LC SLICER There are 5 products. LC Slicer is the best slicer for polymer clay for creating perfect thin and clean cuts - slices of polymer clay. It is an indispensable tool for Mokume Gane (Hidden Magic) technique and for everyone, who wants to get thin slices of polymer canes without distortion. LC Minislicer is a compact, yet a very practical slicer for polymer clay. Due to its compact size, you can take it with you to workshops and enjoy precise cutting without distortion. A newly redesigned version of LC Slicer - a unique tool for cutting thin and precise slices of polymer clay. Czech robust cutting/slicing tool for polymer clay designed for professionals as well as beginners. Comes with LC EASE and a grid sticker for LC EASE. This redesigned version is delivered as a tool kit and needs to be assembled - DIY. LC Angle base was specially developed for LC Slicer and PC technic Mokume Gane and Hidden Magic. This model is not compatible with new model LC Slicer DIY kit 2019 !!! 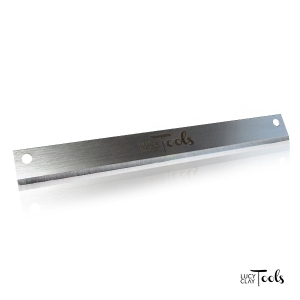 Spare blade for LC Slicer, made from stainless steel. 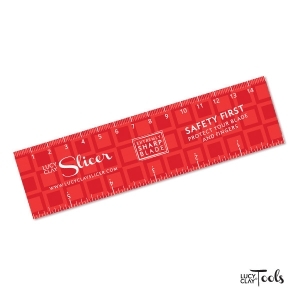 Length 20 cm, thickness 1 mm. The blade of the LC Slicer is extremely sharp. To protect your fingers from acciddently touching the blade, we designed new magnetic Safe-guard. LC Glassymer - Color GEL - Red - 50 ml / 1.69fl.oz. LC Glassymer - Color GEL - Magenta - 50 ml / 1.69fl.oz. LC Glassymer - Color GEL - Green - 50 ml / 1.69fl.oz.